Regular non-Passover recipes will resume next week. 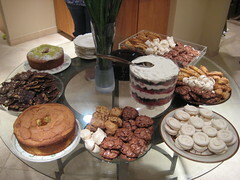 It’s always hard to find Passover desserts that people will take more than one bite of. So when a dessert elicits a YUM response, you know it’s a keeper. This cake is light and airy (it has NINE eggs in it, so it had better be light and airy!) and the flavor is not overly lemony. The cake came together easily and getting it out of the pan was not a problem. I made this for the first seder, and when we nibbled on it the following day, it tasted even better. I think next year I may add a lemon juice and powdered sugar glaze for the top. and photos were the last thing on my mind. Place the lemon juice and grated zest in a small saucepan. Bring to a slow boil. Simmer 4 to 5 minutes. (There should be 6 tablespoons of liquid. If not, add water.) Set aside to cool. Using a fine-mesh strainer, sift together the matzo cake meal and potato starch 4 times. Set aside. Place the egg yolks and whole egg in the small bowl of an electric mixer. Beat on medium speed until the mixture begins to thicken, about 3 to 4 minutes. Add 1 cup of sugar, 1 tablespoon at a time, and continue beating until the mixture turns pale yellow and is very thick. Scrape the sides of the bowl occasionally. Slowly add the oil in a steady stream. Reduce the speed to medium-low. Add the cooled lemon juice and zest and beat until blended. Reduce the speed to low. Gradually add the sifted dry ingredients and mix until the batter is smooth. Transfer to a large mixing bowl. Set aside. Place the egg whites in the large bowl of a mixer. Using clean beaters or the whip attachment, beat the whites on medium speed until frothy. Add the salt. Increase the speed to medium-high and gradually add the remaining 2/3 cup of sugar at the side of the bowl, beating until soft peaks form. With a rubber spatula, fold 1/4 of the beaten whites into the yolk mixture to lighten it. Fold in the remaining whites. Gently pour the batter into an ungreased 10-inch angel food pan with a removable bottom. Smooth the top. Bake in the lower 1/3 of the oven until the cake is golden brown and springy to the touch, 45 to 50 minutes. Remove the cake from the oven and immediately invert the pan onto a wire rack. Cool the cake completely in the pan. 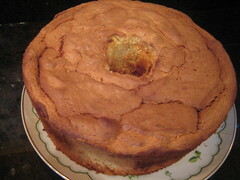 Turn the cake upright and run a thin, sharp knife around the sides of the pan, then around the center tube. Lift the cake by the center tube and remove the ring. Run a knife under the cake to loosen the cake from the pan. Invert the cake and remove the tube section. Transfer the cake to a platter. Store the cake at room temperature under a glass dome or cover with foil up to 1 week. If you have a Passover recipe that you think I should try, please share! 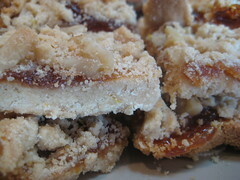 The bar has a buttery cookie base with a chewy fruit center and crumbly top. It got rave reviews at the seder, and I think it will definitely become part of the Passover dessert rotation for years to come. Preheat the oven to 325 F. Grease a 13 x 9-inch glass (I used aluminum) baking pan. Cream the margarine (or butter) and sugar with an electric mixer on medium speed until light and fluffy, about 2 minutes. Add the egg yolks and continue beating until well combined, scraping the bowl as necessary. Then add the lemon zest, vanilla, and salt. Reduce the speed to medium-low and add the cake meal, beating until combined. Press about two-thirds of the mixture over the bottom of the prepared baking pan and bake on the center oven rack for 20 minutes. Remove the pan from the oven and spread the preserves evenly over the crust. Sprinkle the walnuts over the preserves, and crumble the remaining dough over the top. Bake until the topping feels set and is beginning to turn golden, 30-35 minutes (mine was done in about 20). (Check the bottoms. They should be just beginning to turn golden too.) Cool in the baking pan set on a wire rack. Then cut into squares and serve. Recipe adapted from Cooking Jewish. Passover mandelbrot is usually something my mom makes, but this year I decided to give a new recipe a whirl. Unlike Aunt Helen’s (non-Passover) Mandelbrot, this one is made using a mixer rather than a bowl and wooden spoon, but let’s just not tell her that, OK? Thanks! 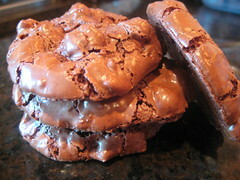 This recipe was easy to make and work with, and the end result is crispy, chocolately, and pretty damn good! (Of course, the real test will be when we taste test them against my mom’s recipe. Stay tuned.) I left mine in the oven for about an hour once it was turned off, but if you don’t want yours so crispy, just take them out earlier. Preheat the oven to 350 F. Line a baking sheet with parchment paper or spray it. Divide the dough into four portions. Flour your hands with cake meal, and form each portion into a log the length of the baking sheet. Space the logs evenly on the prepared baking sheet, and bake on the center oven rack until they are golden and the tops are firm to the touch, about 30 minutes. Remove the baking sheet from the oven and let the logs cool for three minutes. Then, using a serrated knife, cut each log on the diagonal into 3/4-inch thick slices. Place the slices, cut side down, on the baking sheet and bake on the center oven rack until golden brown, 10 minutes. Turn the cookies onto the unbaked side. Turn the oven off and put the baking sheet back in the oven. Leave it there for 15 to 30 minutes for softer mandelbrot, longer for crisper ones. Let the mandelbrot cool completely on the sheet set on a wire rack before serving. Quick note: Tuesdays With Dorie will resume in a couple weeks, once Passover has ended! It used to be that if I were to show up to a Passover seder without chocolate chips meringues, I would be forced to sing the Four Questions, in Hebrew, by myself. OK not really, but trust me, it wouldn’t be a pretty sight. Then a few years ago I brought matzo brittle (in addition to the meringues and other Passover desserts), and that too, became a holiday must-have. Well, this year I do believe I have found a third recipe that will now be included in every Passover seder, thanks to Deb! Hmm, I suppose I should have begun this post by explaining that many Passover desserts elicit the following response: It’s good (for a Passover cookie/brownie/cake). Well, I’m happy to report that with these cookies, I heard, These are sooo good! Everyone who tasted them went back for seconds, and said they were oh so yummy! Then again, I guess that’s what happens when you take a regular, flourless recipe and just make it for Passover, go figure. This cookie is thick, chewy, and slightly crunchy, thanks to the nuts. We made three batches–two with pecans and one with walnuts, and they were all a huge hit. I should note I used regular cocoa powder, not Dutch-process. Update: For those of you having problems with the cookies being too thin and runny, I noticed this comment from someone in Payard’s test kitchen. The suggestion is to not add all the egg whites at once–begin with two egg whites and check the consistency, it should be brownie batter like, and scoop-able. If it’s still too thick, then add more egg whites. Pulse in a food processor or blender. Makes 1 cup Passover confectioners’ sugar. Preheat oven to 350. Spread the walnut halves on a large-rimmed baking sheet and toast in the oven for about 9 minutes, until they are golden and fragrant. Let cool slightly, then transfer the walnut halves to a work surface and coarsely chop them. Position two racks in the upper and lower thirds of the oven and lower temperature to 320. Line two large-rimmed baking sheets with parchment paper. In a large bowl, whisk (or combine in an electric mixer on low speed) the confectioners’ sugar with the cocoa powder and salt followed by the chopped walnuts. While whisking (or once you change the speed to medium), add the egg whites and vanilla extract and beat just until the batter is moistened (do not overbeat or it will stiffen). Spoon the batter onto the baking sheets in 12 evenly spaced mounds, and bake for 14 to 16 minutes, until the tops are glossy and lightly cracked; shift the pans from front to back and top to bottom halfway through to ensure even baking. Slide the parchment paper (with the cookies) onto 2 wire racks. 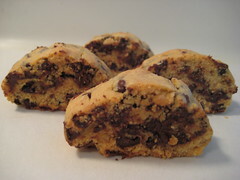 Let cookies cool completely, and store in an airtight container for up to 3 days. Recipe from New York Magazine via Deb.